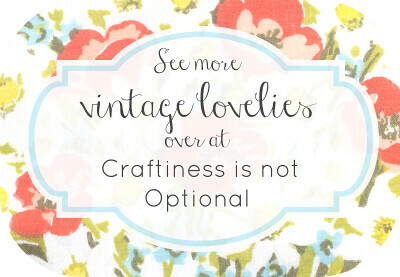 today is the first day of Vintage May! 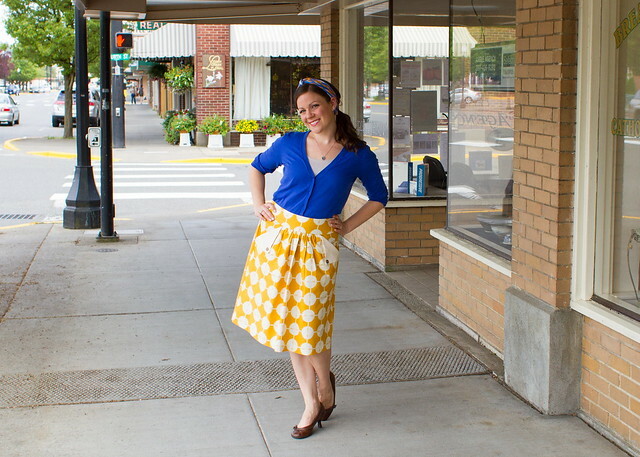 i’m having fun sewing for myself lately, so i thought i’d kick the series off with a vintage-style skirt that i could make look retro or modern, depending on my mood. it’s a current-day pattern with a twist to add the type of special detail you’d expect to see in vintage clothing…a flap pocket. and i’ve included a little tutorial on how to easily modify any pant/skirt pattern to do this yourself! 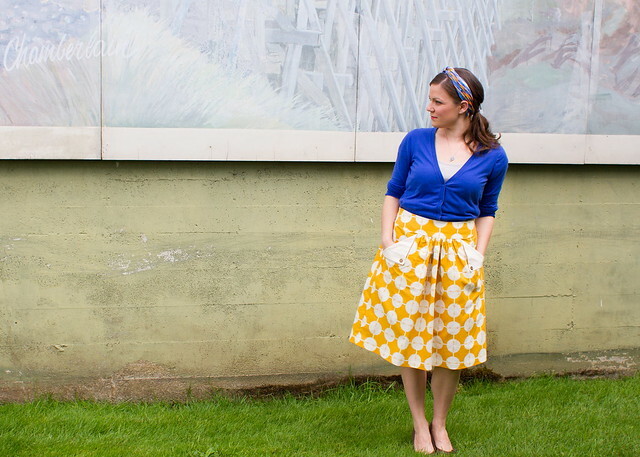 first, a little about the skirt, which i sewed in Anna Maria Horner’s beautiful “coordinates in saffron” cotton from bolt. i love this print and had been saving it for a special project – this fit the bill nicely. wouldn’t it be so gorgeous in field study linen too? love that stuff. the pattern is simplicity 2226, a basic, inexpensive, easy-to-find pattern which i bought back when Anna did a sewalong! i sewed a size 14 but should’ve taken her advice and sewed a size or two smaller to get more waist cinch. it’s comfy as is, but waaay bigger than my store-bought skirts (i’m usually a 6). the pattern instructions are really well-written though – i’d never sewed a non-indie pattern and i was pleasantly surprised at the clarity of it! i sewed view A without belt loops and added an extra 1″ in length just to be sure it hit me below the knee. so i knew i wanted to make a skirt but didn’t know what era to go with. i googled “20s skirts” and “30s skirts” and “40s skirts” on up…aside from the more flowy, flapper-esque look of the 20s and the more structured look of the 40s, there didn’t seem to be TOO much in terms of everyday-type skirts that would make you say “that skirt is from THIS decade.” i made this skirt to have a ’30s vibe (which to me is more casual than the decades surrounding it and slightly art deco) but people i’ve shown say it has a 50s/60s look…so i don’t know. i guess it’s kind of a “know it when you see it” type deal – styled like i typically dress, it just looks like a normal skirt. 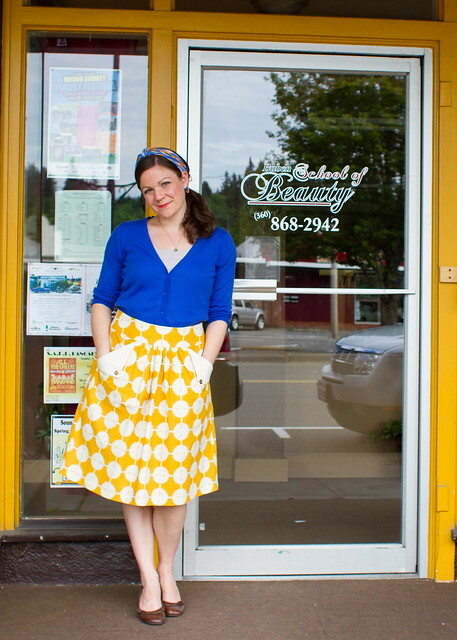 styled with red lipstick and vintage silk headscarf with a tucked-in cardigan, it’s a throwback (especially when you stand next to a beauty school door). anyway, onto the pocket tutorial! this is the same method i used for sam’s shorts in moonrise kingdom film petit, and it’s easy but adds a pretty neat detail. 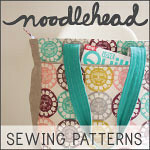 the pattern comes with your typical curved front pockets, so this tutorial is to show you how to modify those. first, lay out your pattern’s skirt front. see the scooped line for the pocket on the far left? 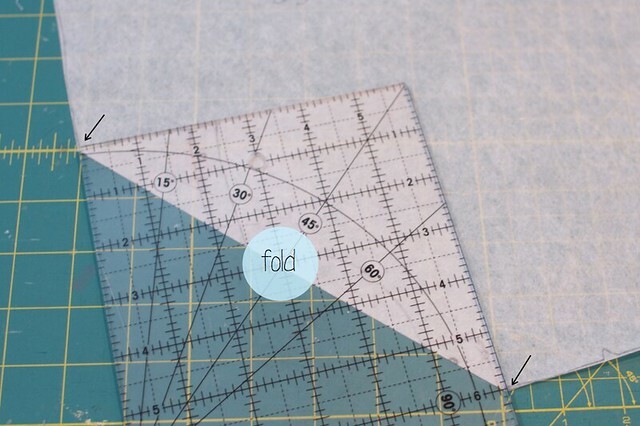 use your ruler to extend the top and side lines to meet at a 90 degree angle. this will become your flap. fold down the corner until it looks like a good proportion to you (in my case it was 6 inches) and mark those spots. add a notch at each mark. overlay the pocket back pattern piece and add notches to match. 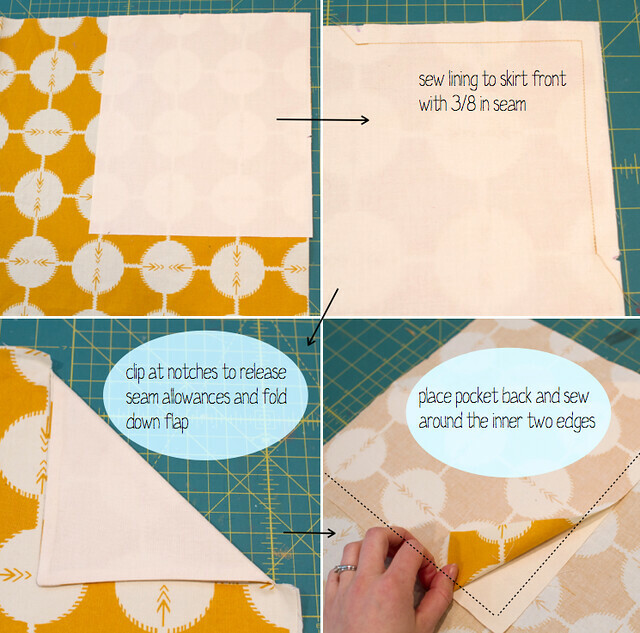 cut two “backs” from your contrast fabric and two from your main fabric. i ended up trimming the pocket back and lining pieces more to a slightly wider square shape versus the rectangle indicated in the pattern, since i was lining it in a contrast fabric and didn’t want to fold it back on itself as the pattern instructs. sew contrast lining fabric to skirt front with 3/8″ seam between the notches, backstitching at both ends and pivoting at the corner. clip corner and turn flap right side out, pushing to a point with your point turner. clip into the seam allowance at the notches to release the flap so it can fold out of the way as you sew the rest of the skirt. then with the flap folded down and the skirt wrong side up, place pocket back over the lining and sew around the inner two edges (in the photo below i’m folding the fabric out of the way so you can see right/wrong sides, but you’ll want to sew it matching the edges – NOT folded up). 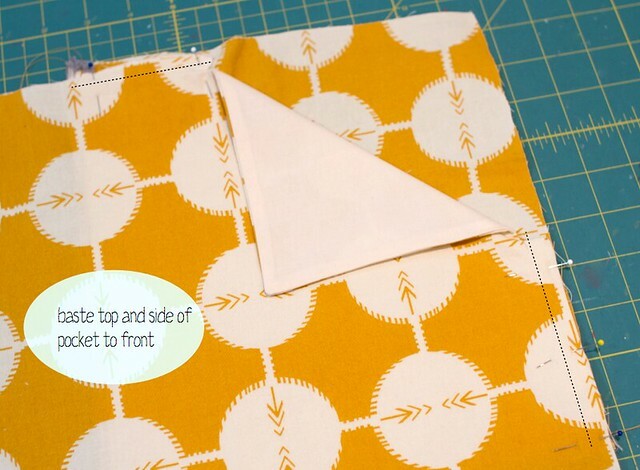 finish the inner edges of the pocket via zigzag or serger. then working on the right side, baste top of the skirt and side so the pocket stays put as you move on to gathering the front, sewing the side seams, and adding the waistband. continue to sew the skirt as indicated. at the end, sew the button on to keep the flap down and add visual interest. 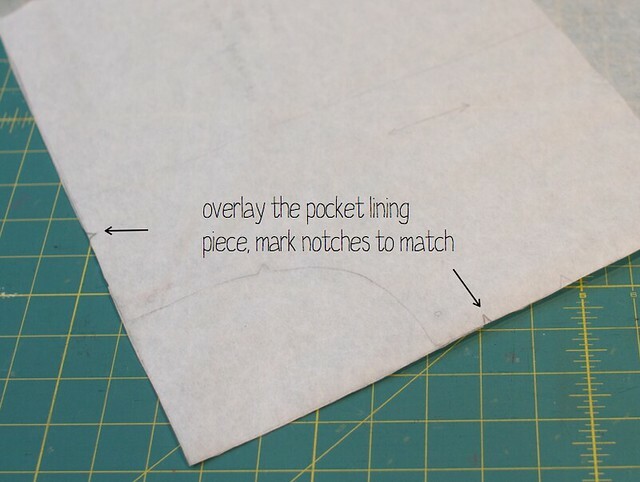 mark 1/2″ from each edge, then sew your buttons between the flap and inside of pocket only (not all the way through the skirt – gotta get your hand in there!). now go hit the town in your new skirt, girl! i never wear a red lip, this was actually my sister in law’s gloss and i felt pretty sassy wearing it…! alright! 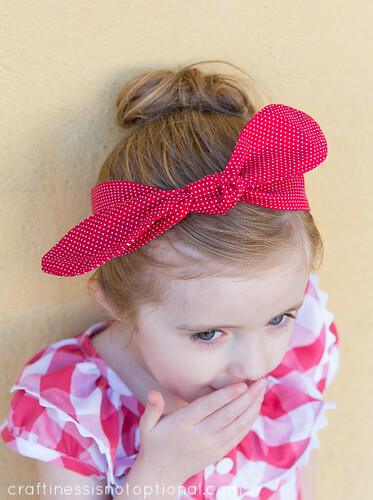 now you KNOW you want to see Jess’ adorable little gal in a vintage-inspired gingham “romper” over at Craftiness is Not Optional…here’s a sneak peek! she is WAY TOO CUTE. back tomorrow with our first guests! Fantastic! You look great, it’s a very flattering skirt. aw thanks!! it’s a fun one to wear for sure. Thanks very much for the tutorial. The skirt looks super cute and the pockets are a lovely finishing touch will definitely be giving this a go. Love this…that shade of yellow is divine! I really need to sew for myself again….you’re inspiring me! i’d love to see you do that! Ok – you two are just the coolest. 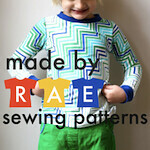 I am loving all the clothing I see made from this fabric! May have to get some for myself! And that skirt is so super cute! Cannot wait to not be pregnant and start sewing for myself again!! You look fantastic, Kristin! 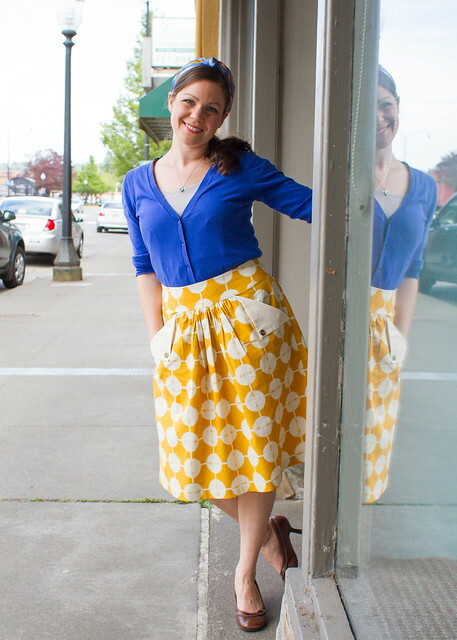 You rock the vintage skirt -whatever era it is:) Love your fabric choice and those pockets are so cute – they are such a great added detail to the basic pattern. I, too, have sewn this pattern but in a basic charcoal grey – so not even close to how cute yours is! 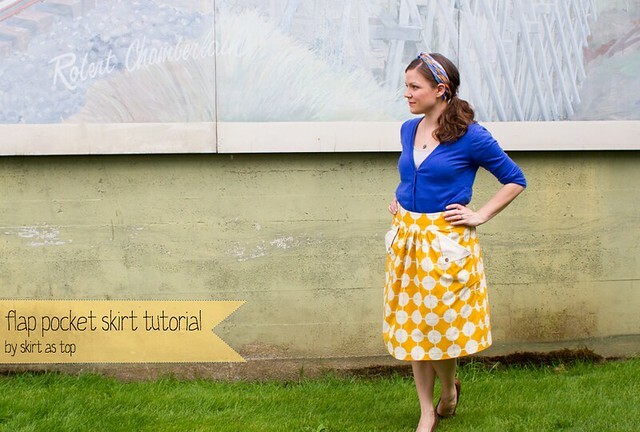 Fantastic skirt, fantastic tutorial. Killed it. It definitely looks like a 30’s skirt to me! Something about the fabric and the color. Great job! phew, love to hear that! thanks, heather! Who’s that pretty girl? You are! Beautiful skirt on a beautiful woman…I love it. Love the skirt and the print, thanks for the pocket I will definately do that on my next skirt, thanks! Meeeeowww! Just in case you haven’t heard your cat-call for the day. Glad to see you sewing for yourself, it is beautiful, love your styling! HAHAHA! thanks caroline, you’re the best. You look adorable!! I love this!! don’t think i’ve ever seen pockets like that before- so cute! oh thank you! honestly i felt a bit silly in the red lipstick at the time, but it looks pretty good in the photos…a nice surprise. so pretty! great job on the skirt – the photos are awesome too! gorgeous, lady! 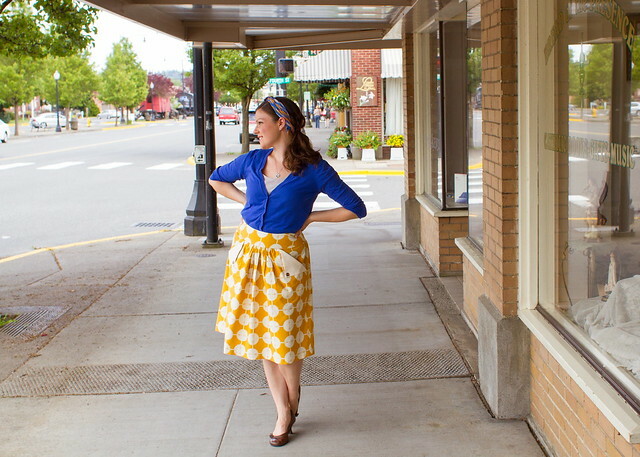 Love the red lips and the blue cardi with the skirt-so vintage! thank you, ma’am! i think i need a polka dot headscarf like sadie’s next. i so need to watch that one! awesome! I love that fabric. My new friend has some of it in her shop and I was eyeballing it today. 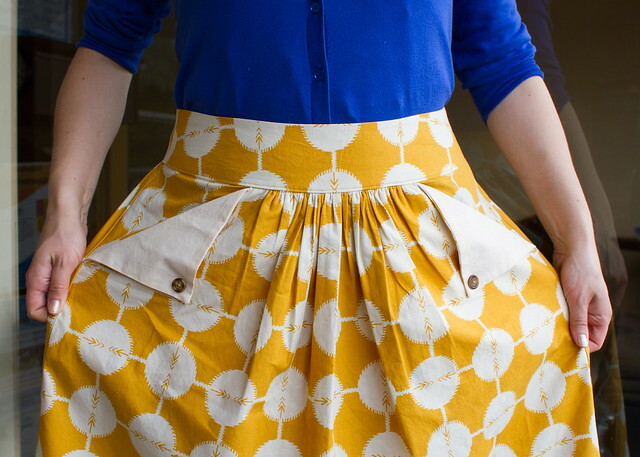 The flap pockets are a very cute addition to the skirt. Cute AS Kristin! I agree with you, it looks like it could be styled vintage or really modern. Such a happy skirt! Nice tute. My daughter loves pockets and this one is new style for her ! Well surely make the next skirt with this style of pocket! Thanks for sharing . Oh, Kriste, this is fantastic!! Love the bright colors, and your cute around-town posing 🙂 I have never sewn a commercial pattern like this, either, and am a little afraid of jumping in without any handholding, but I’m getting closer to the attempt! Maybe this is a place to start, love a gathered, high waisted skirt, and it certainly looks fantastic on you!! it seems the sizing is the oddest part – and on this one it might be a good idea to do a quick muslin of the waistband to get that right. otherwise, it is very forgiving and even the zipper instructions are good! thank you! Red lips totally suit you. You are so adorable. Love the skirt and how you styled it. That blue cardi is perfect with it! In love with the pockets too. I see some pant pockets like this in our future maybe? aw thank you! yes, do it! Love the pockets. I think they would look so cute on pants or shorts for the grandgirl! Eek! You look fantastic! Whats a beautiful skitt! And welcome to the world of big 4 pattern sizing. It’s enough to make you want to pull your hair out when you first start using them! love your skirt! The print and pocket details are awesome. I’ve also wondered what 30s fashion really was as well. Can’t wait to see what else you and Jess have in store! I loved your thanking your husband and mentioning the over-directing, that is me and my husband is to the point helping me take blog photos is “the worst” for him. What these guys go through being married to bloggers. love that AMH print! and i like that your walking around with moonrise kingdom pockets on your skirt :). you’re lookin’ pretty darn cute!! Absolutely gorgeous. 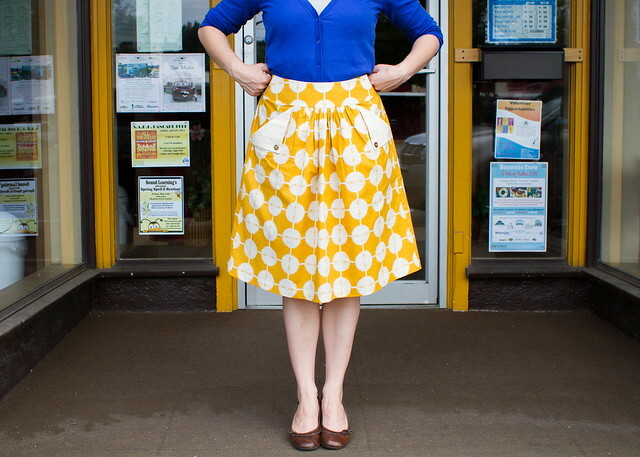 I bought that skirt for the sew along too – when I eventually make it I may just add those amazing pockets. Thanks for the tutorial. I love your skirt and you look adorable in it! This is quite possibly my very most favorite thing you have ever made for yourself AND I love this little photo shoot! Very nice! oh that’s so nice!! thank you, vanessa!! 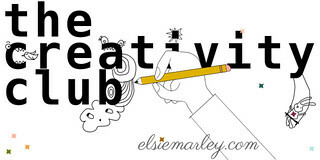 I just discovered your blog & this is the first post I’ve read & I’m already HOOKED! 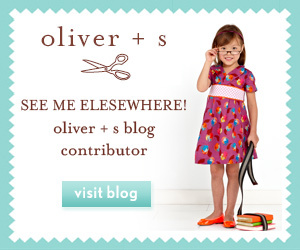 This is freaking adorable beyond words, & I simply cannot wait to try this out myself! What a great tutorial!! I love the older-styles look, so this will be loads of fun to try out. Thanks! Love the skirt, and the whole outfit in fact. 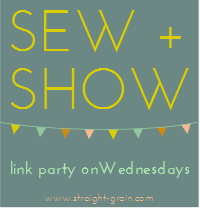 I can’t believe you’ve never sewed a non-indie pattern! I love the pockets on this skirt. I haven’t done them just like this tutorial, but I have made a couple of things with foldover patch pockets. I love how they add a more visual interest than just a big squar pocket. And more comfy to put your hands in too! I also made mine with real buttonholes for the heck of it and I loved how that looked too. Thanks for the inspiration!